Puerto Plata is a large resort area and cruise ship destination that is known for its culture, resorts, history, museums, rainforest beauty, and of course, its beaches. Although historians can't even agree on the date of which this lovely area was first populated, everyone agrees that Puerto Plata in the Dominican Republic is a world-class destination with Puerto Plata Excursions for everyone! Clean, tranquil, safe, interesting...these are the words guests use most when referring to Puerto Plata. Get out and explore! Here are just a few ideas of what's going on in Puerto Plata and we have the excursions that will make sure your visit memorable. Round trip transportation from your Amber Cove cruise terminal in Puerto Plata! English speaking, local certified Puerto Playa shore excursion guides! Guided climb up Damajagua Falls! A scenic drive of the Maimon countryside! Safety equipment including a helmet and life jacket! All taxes, fees and entrance fees included! 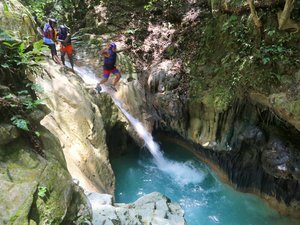 A great opportunity to hike the tropical forest of Dominican Republic and discover Damajagua natural water park in Puerto Plata. Many waterfalls, natural pools, water slides and more! Round trip transportation from your Amber Cove Puerto Plata cruise ship terminal! Fully licensed and insured ATV Excursion! Bilingual (English and Spanish) speaking, professional ATV excursion guide! Automatic ATV shared, side by side all-terrain vehicles! Safety equipment including helmets, goggles, and bandanas! Free time at Playa Dorada beach! Complimentary bottled water on board the transportation! Enjoy your day in Amber Cove exploring the countryside while you drive your own side by side ATV. After your off-road adventure, you will enjoy a beach break at Playa Dorada beach. Round trip transportation from your Amber Cove cruise terminal in Puerto Plata, Dominican Republic! Air-conditioned shore excursion vehicles (van or minibus accordingly with the number of participants)! English speaking, knowledgeable Amber Cove shore excursion guide, and party-host! Visit the famous Damajagua Waterfall! Jump up to 12 of the 27 waterfalls! 30-minute uphill hike lead by a skilled and specially trained guide! Complimentary Rum Punch, Bottled Water, and Soft Drinks! Seasonal fresh fruit and treat! If you are looking for a fun adventure, then this excursion is for you! 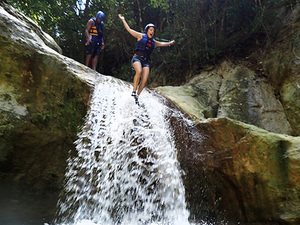 You will discover, jump, and slide down up to 12 of the 27 waterfalls of Damajagua River! At the end of your adventure in the amazing waterfalls, you will party on the bus going back to the cruise port. Helmets for your safe participation! Option to ride single or double same price on automatic Honda 420cc ATV! Visit a Cigars, Coffee and Cacao Factory to see the artisan process and enjoy samples! Complimentary soft drinks and bottled water! 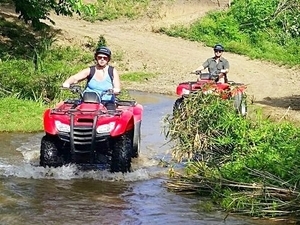 Come to enjoy a 3-hour Amber Cover ATV Shore Excursion around the Amber Cove Port in Puerto Plata, Dominican Republic. Drive through little farms and pristine beaches. See, smell and taste the locally produce tobacco, coffee, and cacao. Cross streams and enjoy panoramic views. 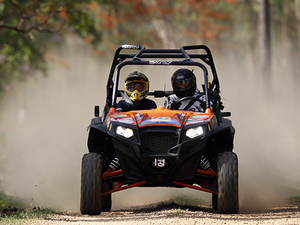 This Puerto Plata ATV excursion has it all! Air-conditioned sightseeing shore sightseeing excursion vehicles (van or minibus according to the number of participants)! English speaking, local certified Puerto Plata shore excursion guide! 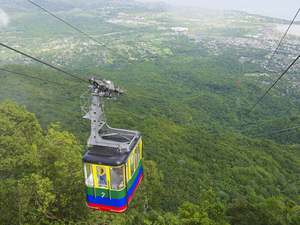 Guests will visit Mt. Isabel de Torres, Fort San Felipe, and Independence Plaza! 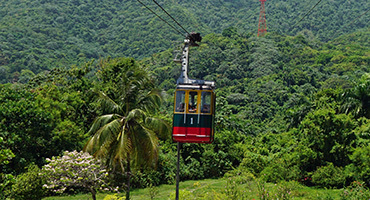 Cable car ride at Mount Isabella! Open bar including rum punch, local beer, sodas and bottled water throughout the shore excursion! Join us for a day of discovery. 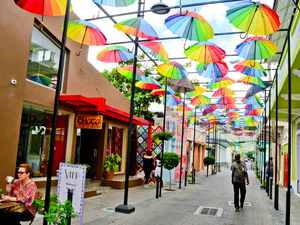 Entertaining and fun shore excursion of Puerto Plata cruise port. From the highest point of the city to the Victorian era district. Enjoy the open bar along the sightseeing excursion too! Guided scenic and city sightseeing excursion! Restaurant and souvenir stores are available for purchases! Guests will visit Rum Factory, Amber Museum, Fort San Felipe, Central Plaza, Malecon, and Cigar Factory! Come and discover the beauty of Puerto Plata with our Amber Cove Sightseeing Excursion that includes the best this tropical city has to offer. Visit the Amber Museum, Fort San Felipe, Cigar and Rum factory and more. This is truly the best of Puerto Plata! Round trip transportation from your Amber Cove Cruise Center in Puerto Plata, Dominican Republic! Short transfers in small groups! "Jump" 7 of the 27 waterfalls! Enjoy 8 ACCT certified zip lines! All security equipment included for all activities! Enjoy 2 of the top activities in Amber Cover. Jump 7 of the 27 famous Damajagua Waterfalls and then you'll feel the adrenaline while you Zip Line through the rainforest. A buffet lunch is included, just bring your adventurous spirit and have fun! 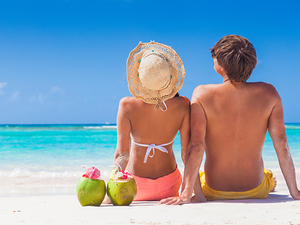 Round trip transportation from your Amber Cove Cruise Center in Puerto Plata! Air-conditioned shore excursion vehicles (small groups)! Short transfer to the Adventure Park (10-15 minutes)! VIP Pass at Country World Adventures Park! 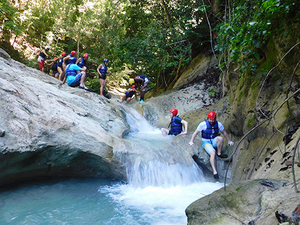 Activities included: Off-Road ATV, 8 Zip Lines, Horseback Riding, and Pool-Zip N'Splash! Enjoy your day in Amber Cove most amazing Adventure Park. 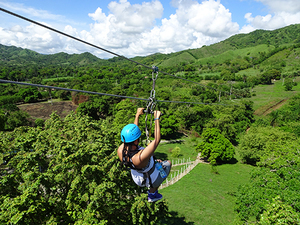 You'll have access to all the activities - ATV, Ziplines, Horseback Riding, and Pool-Zip N'Splash. The park also has a tropical garden and a pool. A delicious Dominican Buffet lunch is included. 4 options at 1 price! Air-conditioned shore excursion vehicles (van or minibus according to the number of participants)! English speaking certified shore excursion guides! City sightseeing highlights - Fort San Felipe, Malecon - Neptune Statue and Independencia Park! 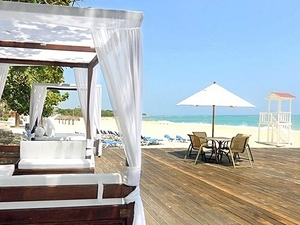 Beach time at the famous Blue JackTar Hotel on Playa Dorada - Golden Beach! Welcome drink at Blue JackTar Hotel! Lounge chair, towel and use of facilities! Free WiFi at the Blue JackTar Hotel! What a great Amber Cove shore excursion to be introduced to the lovely city of Puerto Plata. Air-conditioned comfort with several sightseeing-stops: Fort San Felipe, the Neptune Statue, the Parque Independencia with a final stop at the what's known as "Golden Beach" where you can enjoy some of the best relaxing times at famous Blue JackTar Beach Resort! All zip line equipment included! All necessary horseback riding equipment including riding helmet! For beginners too - all riders matched to horse according to riding experience! 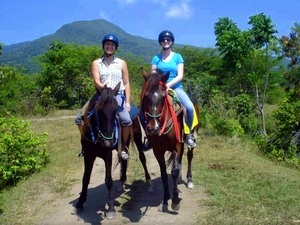 Enjoy this unique excursion and admire the countryside of Puerto Plata via horseback ride. 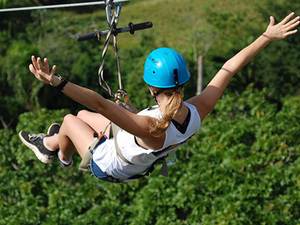 Then get ready for adrenaline while you glide over the zip line park. Have fun! Use of facilities including umbrellas, lounge chairs, towel service, and children's play area! Free WiFi at the Blue JackTar Hotel and beach area! Relax at Playa Dorada known as Golden Beach, considered one of the most beautiful beaches in Amber Cove Puerto Plata. Relax in one of the lounge chairs, swim in the crystal waters of the Caribbean at the luxury hotel and resort, Blue JackTar. Enjoy! Guided nature walk through the Dominican forest! English speaking, knowledgeable Amber Cove nature guide! 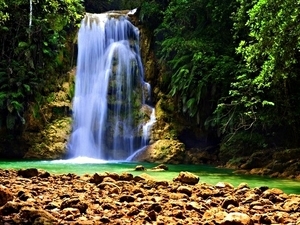 See some of the famous Charco Grande Waterfall! Dip your toes in the water or enjoy a relaxing swim in the collection pool by the falls! Cold bottled water and Rum Punch! Enjoy your Amber Cove Puerto Plata Waterfall Hike and Swim Excursion day in tropical splendor as you enjoy a nature walk through the rainforest and swim in a pristine waterfall collection pool while listening to the sounds of the cascades! A relaxing, low-key, with no falls jumping involved. 4 hours private fishing boat! Up to 8 guests per boat - you decide! English speaking, locally experienced captain, and crew! Professional deep sea fishing equipment and bait! Bottled water, beer, sodas, and snack! 1 or 2 fighting chairs depending on the boat! 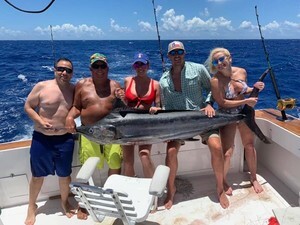 Enjoy the waters of Amber Cove on this private Deep Sea Fishing Charter excursion and see what big fish await you on your private fishing boat for the day! Certified English speaking horseback riding shore excursion guides! Matched up to a horse that suits your experience! Dominican lunch - chicken, salad, rice, potatoes, two soft drinks! Time for swimming in a pristine jungle river! Ride back from the Ranch to your Amber Cove cruise ship terminal! Enjoy a leisurely horseback ride through the foothills of Isabel de Torres mountains, taste some authentic Dominican food and take a dip in the jungle river to refresh! Round trip transportation from your Amber Cove cruise terminal! 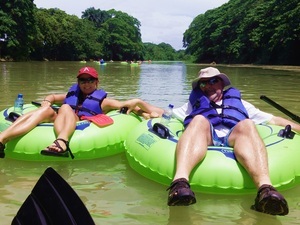 Guided river tubing on the Cabarete River! Special tubes with mesh bottoms and beverage holders! Scenic drive to Cabarete Kite Beach! Tubing Equipment including lightweight life jacket! Come and enjoy a lazy river tubing float and then head off for beach-side activities on this great excursion that has something for everyone! Beach chairs provided by the guide! One welcome and one farewell complimentary Rum Punch! Many restaurants and souvenir stores are available for purchases! Come along with us and enjoy a day at the famous Cabarete Kite Beach! Relax in a chair provided for you right on the beach and watch the many colorful kite boarders that dot the sky.